If you click on the image, it enlarges quite a bit, a little thank you for you all who leave so often the gift of a kind comment here. I have been following your blog for a little while now and thought I should at last comment. I love the pictures your post. This one is great too. I love who the womand with the umbrella is right in the middle of the picture. Was that a lucky coincidence or deliberate? And sorry for my bad spelling in the comment! The Woman in the Red Dress was a lucky coincidence. There is something so magical about this picture. I'm not exactly sure what it is...maybe the dusk coming on....the cascading twinkle lights creating the heavenly ceiling or the wonderful girl . Whatever it is I really do love it. I have been going up and down your posts for some time now. How beautiful! 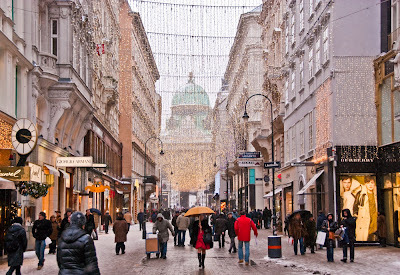 My family and myself have the best memories from our Christmas trip to Vienna in 2007. May I say, it is our reference for the perfect vacation. We spent three nights and feels like we stayed a month. Stopping by your blog and knowing that you care (...) fills me with joy and gratitude. So, dear Merisi, we all wish you a blessed 2011, with good health, a lot of happiness and love, and a joyful heart, open to God's many blessings and man's great works. Well, that must be him on the upper right edge of the photo....but what I really love about this photo is the red dress and the orange umbrella, and all those marvelous strings of light. Caught up with your blog. Just love your pictures at Christmas time! Love the strings of lights! And the woman in red adds such vigor to the picture. Are you time travelling now? I see this wonderful photo was taken in 3010! I look forward to enjoying ever more magic through visits to your blog in the new year...be it 3011 or 2011! May it be a very happy, inspiring and creative one for you.